Today we'll go once again over what we saw in articles 34 and 36 regarding voice-leading according to cadence, exploring in detail voice movements in relation to the most common cadences. But before doing that let's see the motion of the voices during a progression of seventh chords as part of a circle of fifths, which is itself a form of infinite cadence (see article 3). In article 36 you saw that when the root moves down a perfect fifth or up a perfect fourth, the seventh of the first chord moves towards the third of the second chord and vice versa. The same applies for dominant chords. 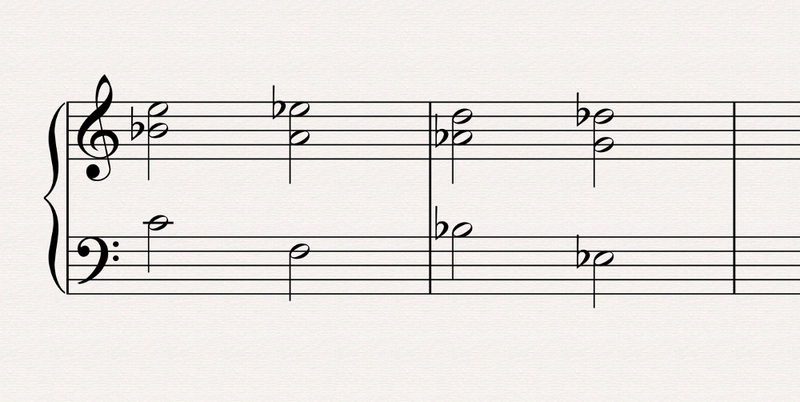 It's interesting to remember that for these chords, the third and the seventh form the tritone. When you have two consecutive dominant chords with an interval of a perfect fourth or fifth, you only need to lower a half-step the two notes of the tritone of the first chord to get the tritone of the second chord. If you recall that the third and the seventh are virtually the most important notes of a voicing, you can build an entire progression of secondary dominants (see article 15) by simply descending the tritones chromatically. This is illustrated in the following example. Do note that between the second and third voicings we preferred to replace the descending fifth of the bass with the ascending fourth, to keep the voicing within the same frequency range. Let's see now what happens with other types of cadence, according to what we discussed in article 7. We'll begin with the II-V-I half-cadence/cadence studied in article 34. As you already know, a half cadence is characterized by a motion towards the fifth degree of the scale. This motion can be started by the II or IV degrees. It's the II degree here. The D in the bass of the first voicing moves towards the G of the second voicing. The upper voice progresses a whole step in an ascending conjoint motion to reach the leading-tone, which characterizes the dominant chord of the second voicing. The middle voices don't move an inch, guaranteeing thus the stability of the movement (yes, I know that seems contradictory, conceptually speaking, but in harmony it's crucial to have something that holds things together so that important motions are clearer!). In the example above, you can see that the chords are in open position and that the voices move in the following way: the bass descends from a perfect fifth of the dominant to the tonic. The rest of the voices follow a parallel conjoint motion. However, according to the resolution motion of article 24, the F resolves to E, and D to middle C, which we had done away with to not overload the voicing. The presence of G in the tonic voicing is not justified by a resolution movement, but only by the will to "enlarge" the tonic chord. Besides, in article 35 you saw that the V degree is not the most important degree of a voicing, and that we could've easily removed it without really affecting the harmonic quality of the voicing. In the next article we'll see more cadences, so stay tuned!